features In short, the DS619slim can do EVERYTHING that the bigger flagship NAS can do. It can support the very latest version of Synology DSM 6.2 (ver. 7 Soon)and with the exception of SSD M.2 media support, gives you more internal storage and equal power to that of the DS918+, DS1019+ and DS718+ - VERY impressive indeed for a NAS family (slim) that has till now been a very modest specification line of devices. value Although the DS619slim is noticeably more expensive than the DS416slim that came out 2 years ago, you are getting so MUCH storage and power in such a small compact chassis. Once you break this down, you do find that the price tag is actually better than the DS918+ and DS1019+. If you are looking for the most powerful Synology NAS that has the lowest footprint on your environment (in all respects), then the DS619slim is definitely the NAS for you! 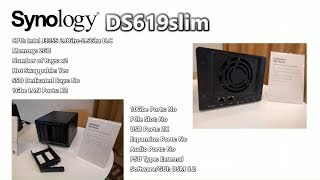 design The Synology DS619slim is one of my favourite looking NAS solutions that they have ever produced. It is more than just the fact that it is smaller enough to fit in my hand - it is that they have taken the design of the DS918+ and the DS1618+ And made a teeny tiny version. The fact it is designed it 2.5" media size in mind means that noise and heat will be very low and to have this kind of storage, at this scale and with such a small footprint is always pleasing. features Despite all the high-end internal hardware (and not too appear ungrateful), it is a shame there is no NVMe SSD or 10Gbe option. I know this would undermine the slim nature of the device a bit, but all that internal power could really take advantage of it. Also, no expansion option of connecting a DX517. value As good as I think the DS619slim NAS is, in a pinch, I would recommend the DS918+ and DS1019+ for those that are buying for power, over storage and silence. Still a Good NAS. Just a shame about the lack of 10Gbe/PCIe option. performance Once again, the lack of 10Gbe or link aggregation beyond 2 ports will limit any user looking at SSD inside the DS619slim. design The fact it cannot support 15mm height drives is a little disappointing given that most 2.5" HDD above 3TB at this height - it marginally limits overall long-term capacity. If you buy this Synology DiskStation NAS and hard drives we do free build and test for the unit and hard drives. So you can use this device straight out of the box. All free of charge in DS619slim price.